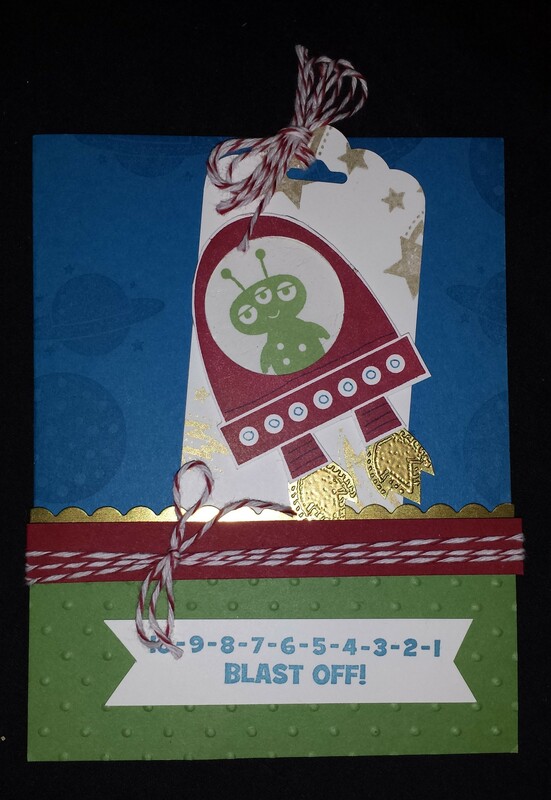 I really wanted to make a fun boy Birthday card so I decided to use the blast off set which I just think is so perfect for little boys. Now the funny part is I started grabbing colors that I thought would look good together and I really wanted to use some of the gold paper since it’s so popular right now so I wanted to make sure the colors I picked would look good with it. I knew I wanted a green alien so I thought the red and blue would look great. I started by stamping my ship and cutting it out. I was trying to decide how I wanted to arrange items on my card and I went to the main catalog to get some inspiration. Come to find out I had picked the same colors just for different items. I decided to make my card similar to theirs. The space ship is popped up with dimensionals and I put in some of our window sheets to give the appearance of glass. I was so inspired from making this card that I had another fun idea that I wanted to try. Years ago I made a fun card that had a pull out bookmark. The minute I saw the new tag punches in the occasions catalog I knew it would be perfect to create a bookmark. 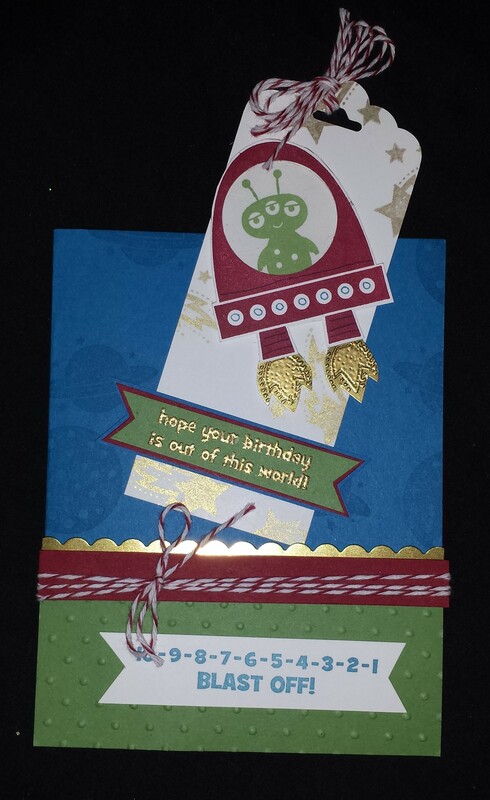 So here’s the card withe the bookmark in the holder. The bottom section is applied with dimensionals to I could easily pull the book mark in and out. I love the 10-9-8 Blast off saying for the front I think it just works perfect for pulling out the bookmark. As you can see once you pull the bookmark out it has the Happy Birthday saying. How cute would this card be with a child’s favorite book for their birthday. Be watching I may just add this cute card to my Februrary Stampin’ Buffet or Club. I saw this card on Pinterest and knew I just had to create it. Such a cute card and so simple. I love that it would be so easy to change out and use different DSP and colors to make lots of cards. The orgional card was created by Swanlady Impressions. What you can’t see very well is the dimension in the card. 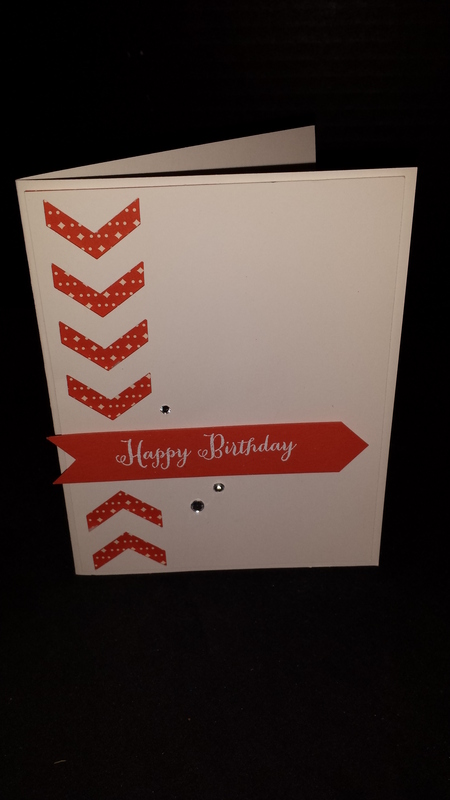 There is a white layer on top of the white card base that is punched with the chevron board punch. The Designer Series Paper is glued to the white card base and the second white paper that is cut is attached with dimensionals to give it some fun depth. I finished it off with just a few rhinestones. The Happy Birthday is also attached with dimensionals. 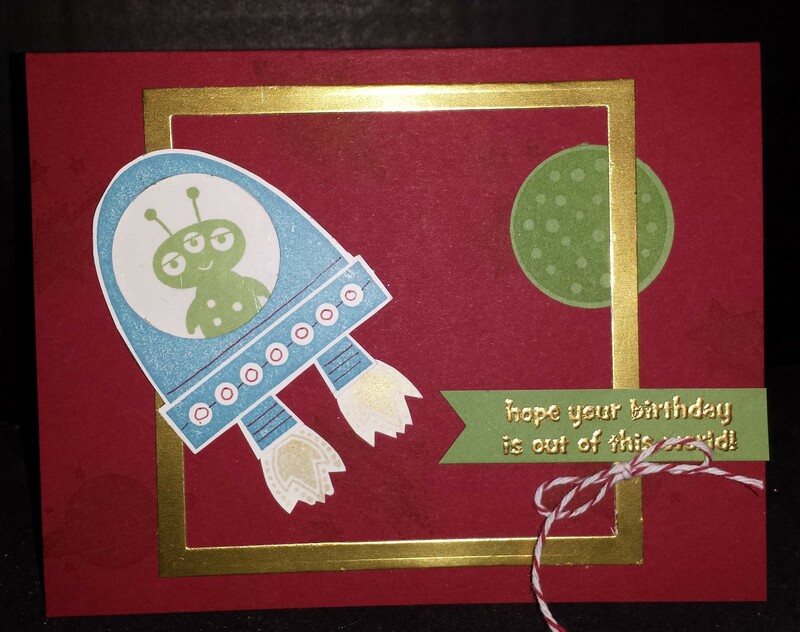 You can come and make this fun card at my February Stampin’ Buffet.